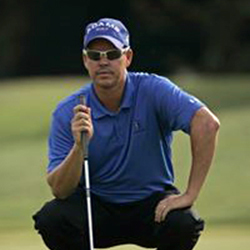 Brad Ott:	Hi this is Brad Ott, Director of Instruction at TPC Craig Ranch, here in McKinney, Texas. Want to talk to you today about warming up all of the golf clubs. What do I mean by that? Well, a lot of my students that I work with, particularly my weekend golfers, when I ask them to start hitting balls, so that we're going to start the lesson and also I ask them whenever they're warming up for a round of golf, what clubs they like to hit. I usually get a similar answer and they'll say they like their favorite clubs. They'll have a favorite club. For example, they may like their pitching wedge, they may live their seven iron, they may like their three wood. Everyone's got their favorite clubs and what happens is the reason their clubs are their favorite clubs is cause they always hit 'em. They always practice with 'em. They always warm up with 'em and it becomes a club that they get real used to. If you have a favorite club, one thing you gotta realize, there's a least favorite club. We all know that when we have a least favorite club, what tends to happen when we're on the golf course? We have a lot of shots with that least favorite golf club. I'm going to give you a tip that's going to allow you to overcome that. One of the things I did when I was on tour, my coach and I talked about this, was to have even and odd number days. What I mean by that, on Monday, Wednesday, Friday, we call that odd days. On Monday, Wednesday, Friday, I'm a three wedge system guy, so I would start off with my 56, I would go to my nine iron, my seven iron, my five iron and my three iron. On even number days which we called Tuesday, Thursday, Saturday, I would go through my lob wedge, my pitching wedge, my eight iron, six iron, four. At the end of the week, I would have had three different sessions with all of my golf clubs in my bag. What does this help with? Well, I really didn't have a favorite club in the bag. I hit 'em all about the same amount. If there was a club that I wasn't comfortable with, I probably overcame that un-comfort by practicing with it every day, warming up with it everyday. What I would encourage you to do, come up with your pattern. If you want to use my even number, odd number that would be fine. If you want to have one day you use your sand wedge, nine iron, seven iron, five iron and the next day you just keep track of it yourself. That would be very accessible. Make sure that you have some type of system that allows you to warm up with every club in your bag on every day. That way you don't have a least favorite or a favorite club cause we all know once we get on the golf course, we want all of our clubs to be favorite.